A Fully Anechoic Room (FAR) is an anechoic chamber that has a substantial covering of anechoic material on the floor to effectively remove the ground reflection associated with a semi-anechoic chamber. Without a ground reflection, it no longer becomes necessary to sweep the receive antenna height, which can simplify testing procedures and result in shorter radiated emission test times. 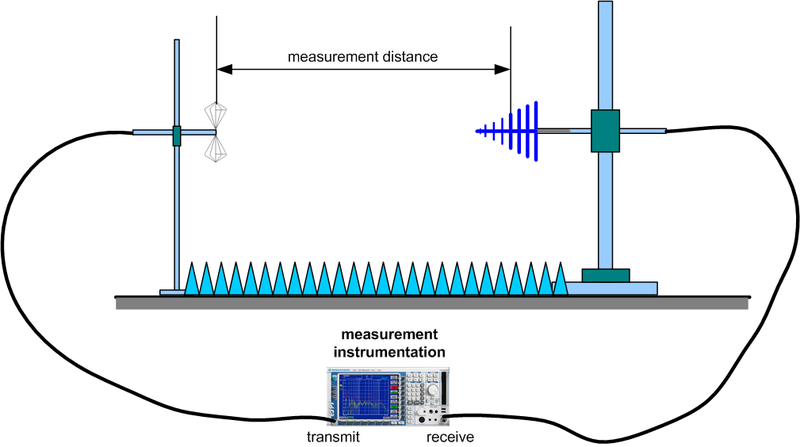 The validation procedure for a FAR is equivalent to the Normalized Site Attenuation (NSA) measurement used to validate semi-anechoic chambers for emission measurements. The FAR validation is described in the standard CISPR 16-1-4 and is also referred to as an NSA measurement. These measurements are required for validating new FAR chamber installations and also for regular recalibration of your existing facilities. 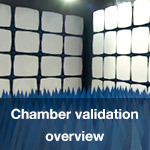 For new FAR chamber installations, using the services of an independent measurement provider will give you the confidence that your new chamber is validated accurately and impartially by a competent 3rd party. We can accurately measure the NSA performance of new FAR chambers as well as FAR chamber relocations, upgrades and modified chambers worldwide. For regular recalibration some laboratories may choose to perform the FAR validation in-house, however this can be a more time consuming and less accurate option than using an independent company specializing in these measurements. It also requires the use of special antennas with specific antenna calibrations. We use custom software and measurement procedures to ensure that the FAR validation measurements are completed quickly, resulting in minimum chamber downtime for you and less disruption to your laboratory testing schedule. 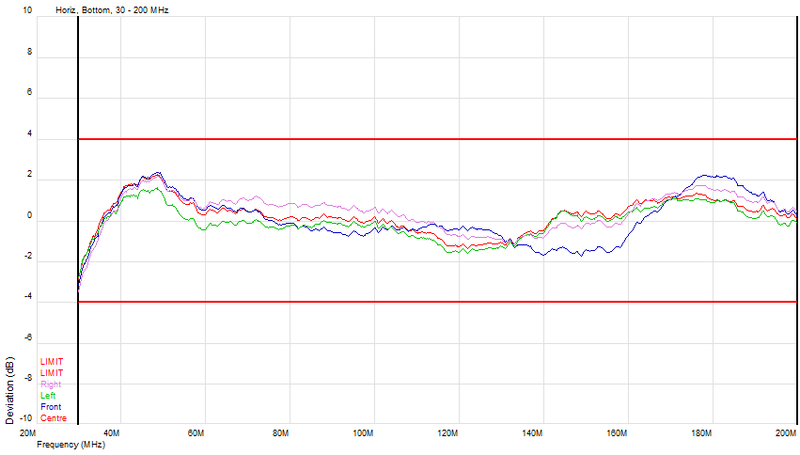 Typically we measure the NSA of a FAR chamber in less than a day. Our engineers have many years of experience in the measurement of NSA in FAR chambers worldwide. By using our measurement services your laboratory personnel are available to do more productive work without needing to fully understand unfamiliar measurements that they would only be performing infrequently anyway. NSA measurements for FAR chambers require special antennas with specific calibrations. We supply all of the required equipment so that you do not need to own and maintain specific antennas for these measurements. The method described here is applicable only to fully anechoic chambers. 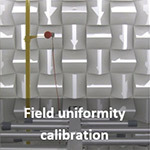 The method used for measuring the Normalized Site Attenuation of semi-anechoic chambers (e.g. with a ground plane) is described on a separate page here. 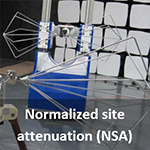 Normalized Site Attenuation is used to validate FAR chambers for radiated emission measurements usually over the frequency range 30 – 1000 MHz. 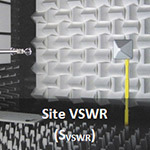 For measurements above 1 GHz an SVSWR measurement is performed in order to validate the chamber’s suitability for radiated emission measurements as described here. The principle behind the NSA measurement is that the loss is measured between a pair of antennas and then this loss is then compared against the loss for a ‘perfect’ site and any difference is deemed to be a deviation caused by imperfections in the site. In the case of a FAR chamber, the ‘perfect’ site is a free-space environment (i.e. with no reflections from any direction). This differs from the NSA for a semi-anechoic chamber where the perfect site has a reflecting ground-plane. The basic geometry for the measurements is shown below. Both the transmit antenna and the receive antenna are positioned at fixed heights (there is no need to scan the receive antenna height in a FAR chamber). Measurement distances are usually 3m, although 5m and occasionally 10m measurement distances are also used. If the NSA is measured only at a single position (e.g. at the centre of the turntable), then it is possible that any reflections from the chamber construction might not be picked-up. To avoid this possibility, a series of measurements at different positions, polarizations and heights are required. The measurement geometries are described in CISPR 16-1-4 and consist typically of a number of positions around the turntable area (or the space where the EUT will be located). The size of this area will depend on the chamber design and the size of turntable or EUT. Measurements are made in both horizontal and vertical polarisation and with the transmit antenna located at three different heights (bottom, middle and top of the test volume) and five positions (centre, left, right, front and rear of the test volume diameter). The rear position can be omitted provided that it is located more than 0.5m away from the nearest absorbers. The receive antenna height is fixed at the middle height of the test volume for all of the measurements. 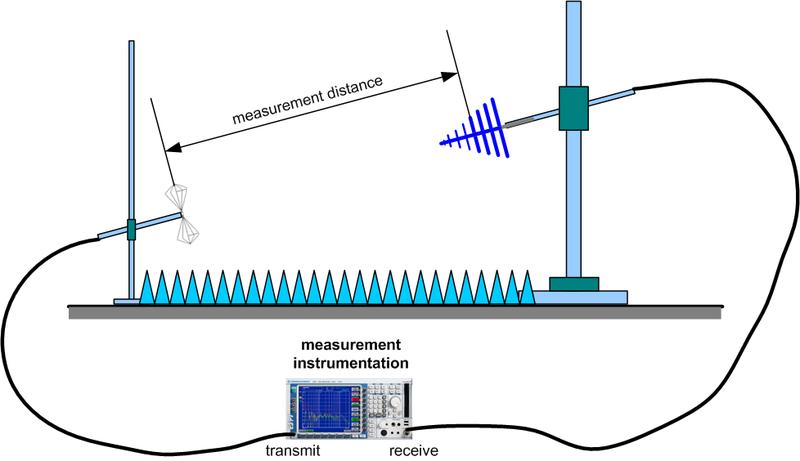 When measuring the positions at the top and bottom of the test volume, the transmit and receive antennas are tilted as required to align the boresight axes of the antennas. The transmit antenna is typically a small biconical antenna and the receive antenna should be the same type as used during radiated emission testing of the EUT. Typical receive antennas would be hybrid (Bilog) antennas or biconical and log periodic antennas. Note: CISPR 16-1-4 does not recommend the use of hybrid (e.g. Bilog type) antennas for use in a 3m FAR, either for testing of the EUT or for the FAR site validation. This is due to the large physical size of the antenna relative to the measurement distance. The site attenuation measurement results are conventionally given in terms of deviation from an ideal test site. The usual specification for compliant chambers is that the deviation should be less than ±4dB. If you have any questions or need advice on the best chamber calibration for you then Contact us to discuss your requirements.